Defending champion Jonathan Rea is keen to get back to winning ways in the second round of the World Superbike Championship at the Chang International Circuit in Buriram, Thailand after three second place finishes at the opening round in Australia. Four-time champion Rea relishes the opportunity to extend his all-time record total of race victories beyond his current 71 and the Ulsterman has an enviable record at the venue of six race wins and an additional podium in eight race starts in Thailand. 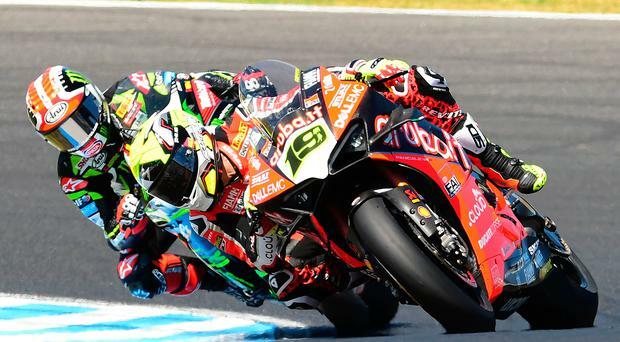 The dominance of debutant Alvaro Bautista and the all-new Ducati V4R surprised many at Phillip Island, but Rea and his Kawasaki Team will not take the three defeats lying down and will look to bounce back to the top of the podium in what should be an interesting showdown, now over three races each weekend. Rea said: "The circuit is one of two halves; the first being fast stop-and-go sections and then the fast-flowing final sectors, which play to the Ninja ZX-10RR's strengths. The goal is to build on our Phillip Island results." Team GoEleven and Eugene Laverty will look to continue the development of the new Ducati V4R with the aim of putting the Toomebridge man in the best possible position to chase top six finishes in what are expected to be extremely hot conditions. Tyre wear could play a major role in the weekend's two main races, although will not be a problem for the new Sprint race on Sunday morning. Meanwhile, Glenn Irwin was second fastest on his JG Speedfit Quattro Plant Kawasaki on the second day of the British Superbike three-day test at Monteblanco in Spain, 0.418 seconds behind the Yamaha of Jason O'Halloran with ex-MotoGP rider Scott Redding third on the PBM Ducati V4R, a similar machine to the one Alastair Seeley is to ride in the NW 200 Superbike races in May. Andrew Irwin was ninth on his Honda just over a second behind the fastest time of the day, with Josh Elliott 11th on the OMG Suzuki. Graeme Irwin was third fastest Superstock rider, continuing his transition from motocross to tarmac on the Team #109 Kawasaki, while Lee Johnston and Seeley set the pace in Supersport. The motocross championship season kicks off at the new Robinson's Quarry circuit near Claudy tomorrow, a week behind schedule due to the inclement weather. Racing starts from 11am and admission is £5.